The new permit is to take effect on April 1. It will replace the Alien Employment Permit and the Foreign Experts Certificate, issued by two different government agencies, for which expats sometimes had to spend months obtaining. The State Administration of Foreign Experts Affairs will be responsible for organizing and implementing the issuance of the new work permit. The new policy is more market-oriented and more quantitative compared with previous ones. Actually, a trial operation has already been in progress in Shanghai since September last year when the city issued its first single unified work permits to ease the burden of highly skilled expats seeking jobs in the city. While commenting on the new work permit policy, Legal Weekly said it signifies that the "threshold" – namely the standard for foreigners coming to China – has been lowered to a certain extent amid the country's efforts to attract more foreign talent to speed up its development. Wang Huiyao, head of the Center for China and Globalization (CCG), highly appraised the new move, saying that it shows China's immigration policy is becoming more open, inclusive and flexible. Wang made the remarks in an interview with Legal Weekly. For a long time, permanent residence permits for foreigners in China, known as green cards, have been described as "the card which is most difficult to get in the world " due to its extremely complicated application procedure. Wang believed that there were many obstacles in the country's policy and mechanism in attracting foreign talent. He cited two examples – decentralized administrative departments and complicated application procedures – that have brought a lot of troubles to immigrants. It usually takes a foreigner several years to get a green card in China, during which the applicant must have a good record of performance and make a certain contribution to the country's development. The following are three representative foreign figures offered green cards by the Chinese government. 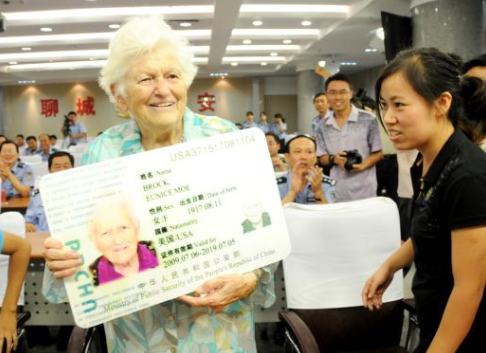 In 2004, Joan Hinton (Han Chun), an American citizen, was the first foreigner in China to receive a green card – the permanent residence certificate presented by the Chinese government. She was 83 years old and had worked and lived in China for 56 years. She died in a Beijing hospital on June 8, 2010. In 2016, Stephon Marbury, a former NBA star become the first foreign basketball player to get China's green card in the Chinese Basketball Association (CBA) league's 21-year history. He received the permanent residence certificate from Zhang Jiandong, vice mayor of Beijing, during a ceremony in Beijing. The 39-year-old veteran, who had steered Beijing to three titles in four seasons and been named an honorary citizen of Beijing in 2014, was recognized as the most successful foreign player in CBA history. Also in 2016, Popova Liliya Annatuoliyefuna, a Russian expert who had worked in the Daqing Ophthalmologic Hospital for 18 years, obtained the permanent residence permit issued by the Ministry of Public Security. She became the first foreigner to obtain permanent residency as a special talent in northeast China's Heilongjiang Province. Statistics from the Ministry of Public Security show that, 1,576 foreigners became permanent Chinese residents last year, an increase of 163 percent over 2015. Foreigners who come to China to work will get a unified work permit as the country tries to streamline application formalities to attract more foreign talent.